DAMASCUS, Syria A Syrian state-run newspaper on Sunday called President Barack Obama's decision to seek congressional approval before taking military action against Syria "the start of the historic American retreat." The gloating tone in the front-page article in the Al-Thawra daily followed Obama's unexpected announcement on Saturday that he would ask Congress to support a strike punishing the President Bashar Assad's regime for the alleged use of chemical weapons. The decision marked a stark turnabout for the White House, which had appeared on the verge of ordering U.S. forces to launch a missile attack against Syria. As the Obama administration waits for Congress to vote, it is taking its case to the public. Sec. of State John Kerry on Sunday told guest host Major Garrett on "Face the Nation" the U.S. has firm evidence Sarin gas was used in the chemical attacks the administration is pointing to as a reason for intervention. "We now have samples back from first responders in East Damascus," Kerry said. "Those samples of hair and blood have been tested and they have reported positive for signatures of Sarin. So, we are now getting a stronger case each day. The credibility of the United States is on the line here and I believe that Congress will do the right thing." The president's decision to take this to Congress came as a surprise even to his own advisers, reports CBS News correspondent Bill Plante. While the president has said the does not want to proceed alone, and that he wants members of Congress on the record, rather than simply criticizing from outside whatever action he takes, Syrian media took the move differently. "Whether the Congress lights the red or green light for an aggression, and whether the prospects of war have been enhanced or faded, President Obama has announced yesterday, by prevaricating or hinting, the start of the historic American retreat," Al-Thawra said. The paper, which as a government outlet reflects regime thinking, also claimed that Obama's reluctance to take military action stems from his "sense of implicit defeat and the disappearance of his allies." The daily said the American leader worries about limited intervention turning into "an open war has pushed him to seek Congress' consent." Syria's minister for reconciliation issues, Ali Haidar, echoed that line. "Obama has given himself a chance to take a step backward by talking about Congress' approval and to search for other parties to participate in the attack," Haidar told The Associated Press by telephone. "In other words, he wants to keep brandishing the sword of aggression on Syria without fully giving up the idea of an attack and even without setting a definite date for the aggression." The U.S. Navy moved warships over the past week into the eastern Mediterranean as the Obama administration considered its options. With everything in place, Obama said Saturday that he had decided the U.S. should take military action and that he believes that he has the authority as commander-in-chief to "carry out this military action without specific congressional authorization." But he added that he believes the U.S. "will be stronger" if he takes his case to Congress for its nod of approval before taking action. Congress is scheduled to return from a summer break on Sept. 9, and in anticipation of the coming debate, Obama challenged lawmakers to consider "what message will we send if a dictator can gas hundreds of children to death in plain sight and pay no price." While there is some public support for strikes in Syria, most recent polls show the majority of Americans not in favor. 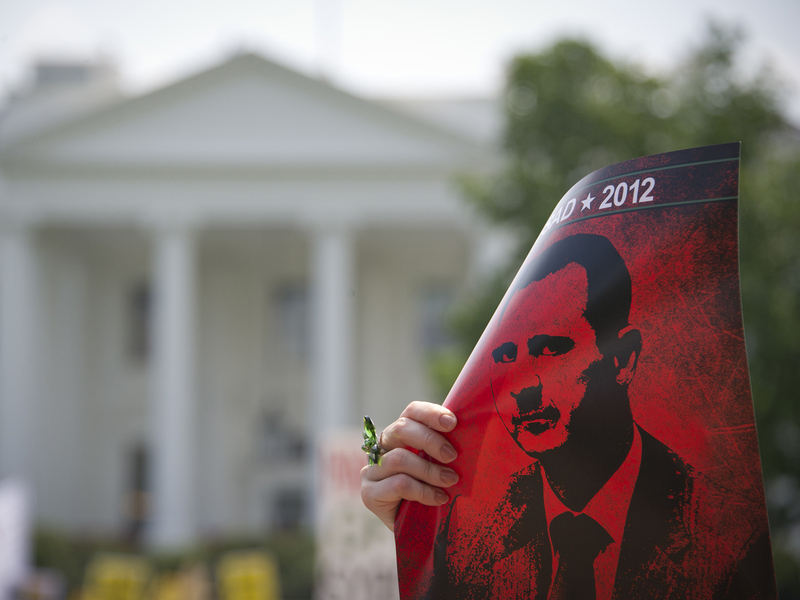 Outside the White House on Saturday, protesters called possible military action in Syria illegal and immoral. "The American people are opposed to it," said one protester. There were dozens of people, like 28-year-old Lana Ismail. "In war, the first thing to go is the truth," she said. A Syrian-American, Ismail said she's seen the horrible aftermath, but she doesn't know who to believe or trust. "I think the U.S. should get all the facts straight before we go in," she said. The White House has sent Congress a draft of a resolution seeking approval for a military response to "deter, disrupt, prevent and degrade" the Assad regime's ability to use chemical weapons going forward. The Senate will hold hearings next week so a vote can take place after Congress gets back to work. The president's strategy carries enormous risks to his and the nation's credibility, which the administration has argued forcefully is on the line in Syria. Obama long ago said the use of chemical weapons was a "red line" that Assad would not be allowed to cross with impunity. On Saturday morning, the president held a two-hour meeting in the White House Situation Room. Aides said there was some debate over the risks of waiting to act, but the president determined that the U.S. must strike because he believes that U.S. national security interests are at stake. Britain's prime minister, David Cameron, charted a similar course last week by asking the House of Commons to support military action against Syria, only to suffer a stinging defeat. For some in Syria's opposition who had put great hope in U.S. strikes, Obama's decision was a source of despair. For others, it was seen as simply business as usual from a country that they say has done nothing to halt the massive trauma and bloodshed gripping Syria. "We weren't putting too much hope in the U.S strike," said Mohammed al-Tayeb, an opposition activist in Eastern Ghouta. "America was never a friend of ours, they're still an enemy." In the buildup to the potential strikes, the opposition and Damascus residents say the Assad regime moved it troops and military equipment out of bases to civilian areas. The main Western-backed opposition group, the Syrian National Coalition, said in a statement Sunday that the army repositioned rocket launchers, artillery and other heavy weapons inside residential neighborhoods in cities nationwide. Two Damascus residents the AP spoke with confirmed the regime troop movements. One woman said soldiers had moved into a school next to her house and she was terrified. With U.S. strikes no longer looming, the U.N. probe into the attack has at least a week and a half to analyze samples it took during on-site investigations before the specter of military action comes yet again to the fore. The head of the U.N. team, Swedish professor Ake Sellstrom, is to brief U.N. Secretary-General Ban Ki-moon later Sunday. The group of experts collected biological and environmental samples during their visits to the rebel-held Damascus suburbs that were hit in the Aug. 21 attack. The inspectors left Syria on Saturday and arrived in The Hague, Netherlands. The samples they collected in Syria are to be repackaged and sent to laboratories around Europe to check them for traces of poison gas. The U.N. says there is no specific timeline for when their analysis will be completed. There are widely varying death tolls from the suspected toxic gas attack. The aid group Doctors Without Borders says at least 355 people were killed, while the Britain-based Syrian Observatory for Human Rights monitoring groups says it has identified 502 victims by name. A U.S. intelligence assessment says the attack killed 1,429 civilians, including more than 400 children. In Cairo, Arab League foreign ministers were to hold an emergency session Sunday evening to discuss Syria. Last week, the 22-nation bloc condemned the Aug. 21 attack outside Damascus but said it does not support military action without U.N. consent.